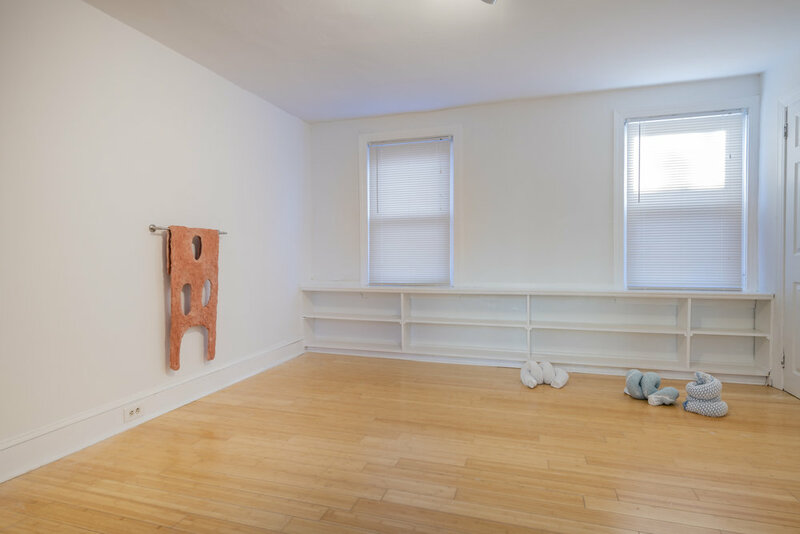 56 HENRY is pleased to present Oren Pinhassi: Better safe than sorry, an exhibition of sculptures staged in a Philadelphia eighteenth century trinity home. Narrowly built, and featuring a one-room-per-floor layout, these homes’ minimal forms were designed to contain the city’s working class families. 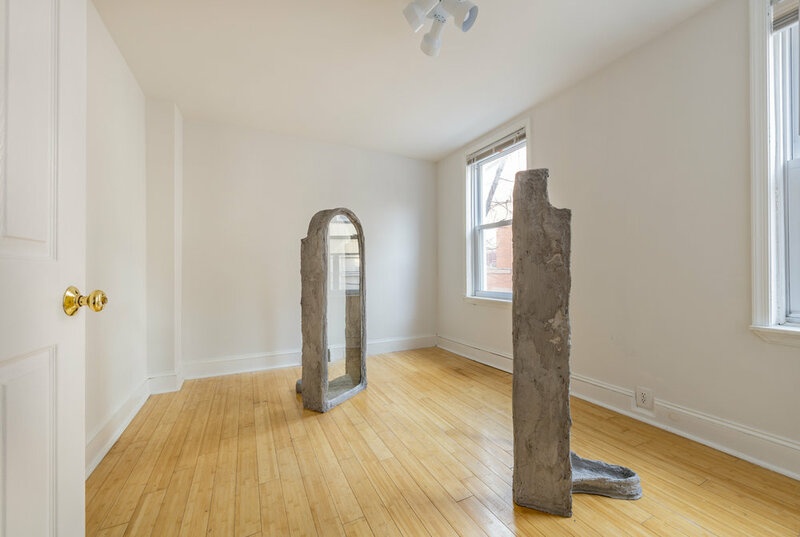 At this unique site of labor, architecture, and the body, 56 Henry invites Pinhassi to stage a grouping of his haptic, corporeal sculptures. The selection of work will be on view from November 24 through December 31, 2018. 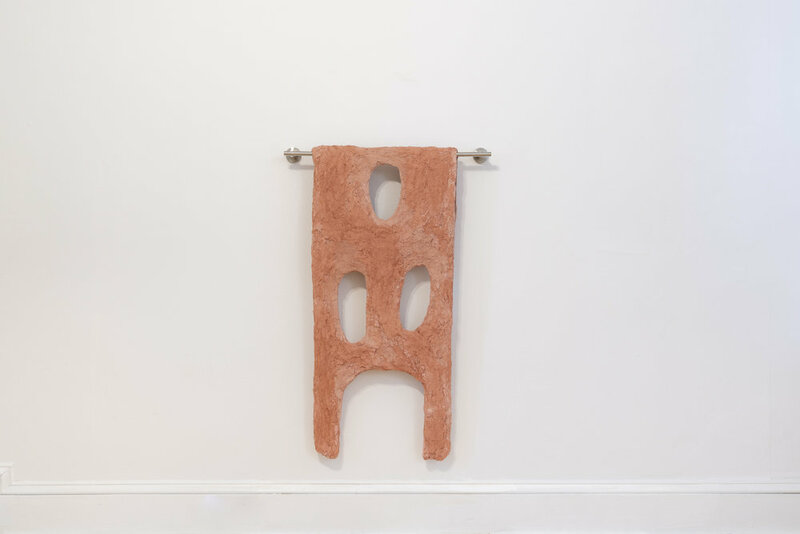 Composed with steel, cement, plaster, or hand towels, Pinhassi’s subverted use of materials situate the work at a moment of slippage, where the realms of public and private fluidly intersect. InUrinals (NYC 1 & 2), two urinal-esque forms face each other; Though the centers of both objects are filled with a pane of glass, the forms’ daunting transparency becomes psychologically opaque, as the viewer begins to observe the stark relationship between lack and desire. 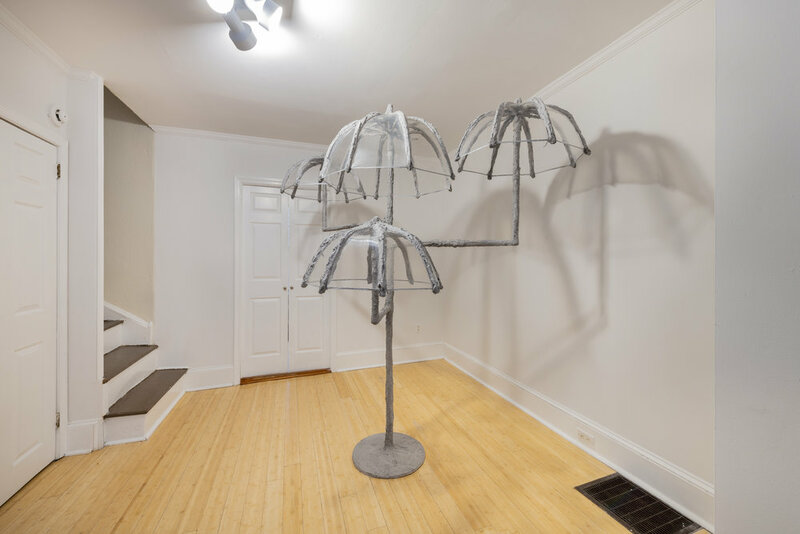 And in Better safe than sorry, four umbrellas are frozen within a tree-like form of burlap, sand, plaster, and steel. In its stagnancy, the item transforms the umbrella from an isolated portable unit, into a space for bodies to intimately gather, and shelter themselves from external forces. 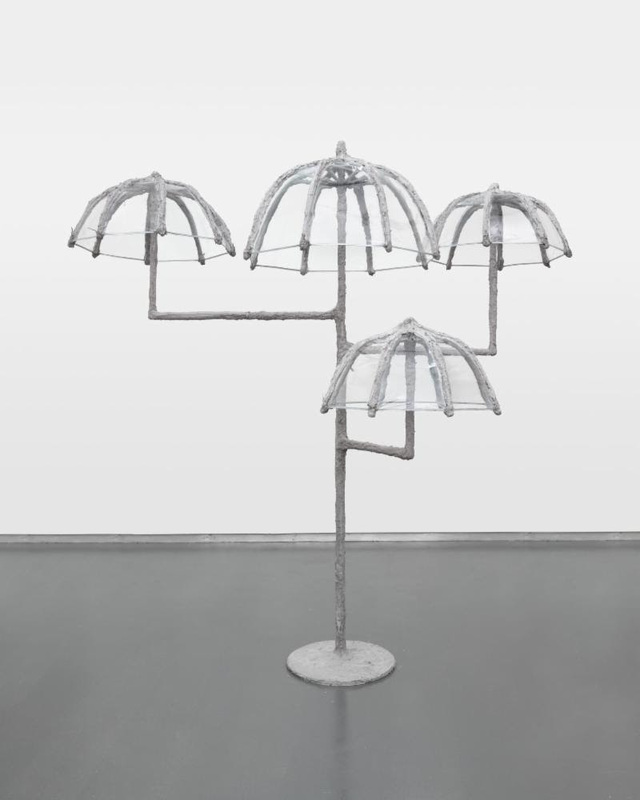 The base and arms on which the umbrellas sit, are molded with such tactility that the viewer might imagine the weight of the artist’s hand, or envision their own palm, wrapped around the object. It is at this cross-section of an object’s intended function, and its failure to comply with such expectations that Pinhassi locates a queer sensuality. 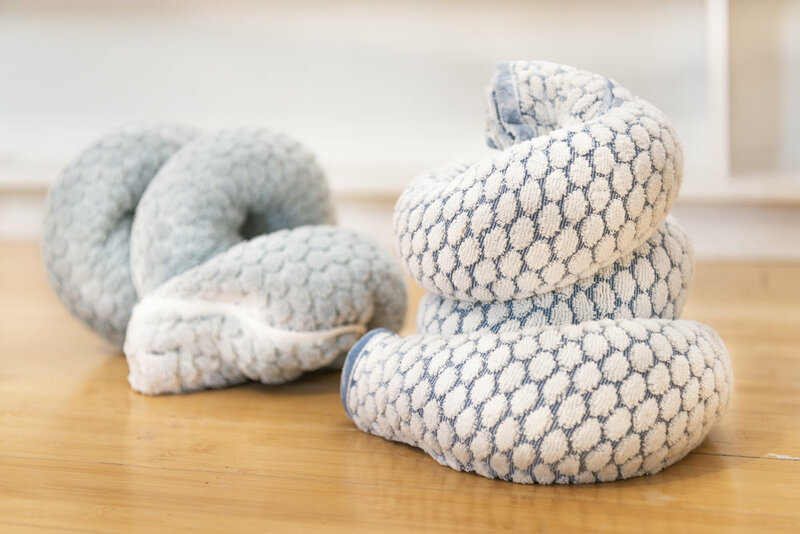 For example, in Untitled (towel bricks), Pinhassi reimagines the materiality of a brick––a construction unit designed specifically to fit in the hand of a human––with that of a cotton bath cloth. As the brick and the fabric exchange a dialogue on function and scale, they begin to perform each other’s identities, all at once. It is in works like this, that Pinhassi’s non-binary logic takes charge. As forms shift between the body, furniture, nature and architecture, the objects simultaneously evoke an array of signifiers. Here, categorization becomes a futile lens through which to read Pinhassi’s malleable language; In order to see the work as whole, all of the suggested subjects must be taken into consideration. For those traveling from New York, Focus Travel has an hourly bus which departs from Allen and Division ($12 one way). The bus station in Philadelphia is a twenty minute walk from the exhibition location. Oren Pinhassi lives in New York City. His work has been the subject of solo exhibitions at 55 Gansevoort, New York; Skibum MacArthur, Los Angeles; Edel Assanti, London; Petach Tikva Museum of Art, Israel and RIBOT Gallery, Milan. 1637 Rodman Street will be open readily by appointment. Please contact info@56henry.nyc to schedule a visit or for further information.